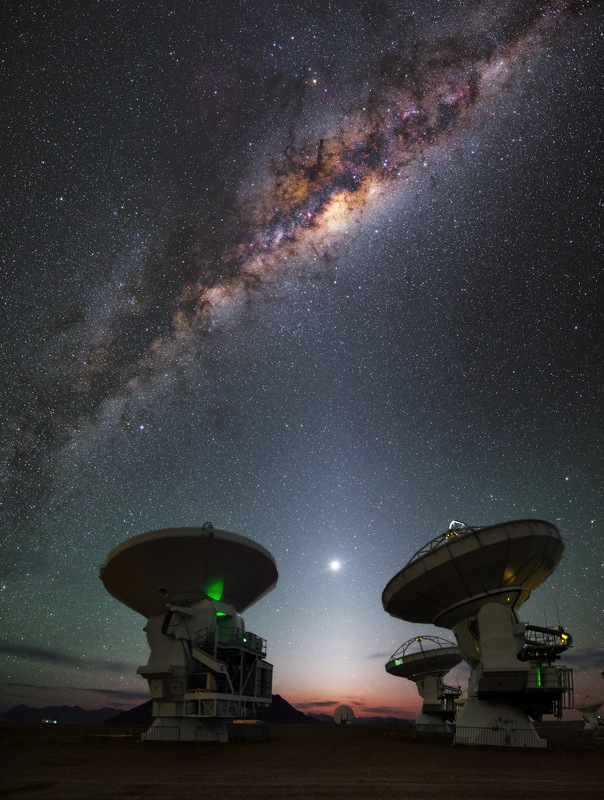 This image shows a number of antennas from the Atacama Large Millimeter/submillimeter Array (ALMA), a state-of-the-art telescope array positioned high in the Chilean Andes. A full Moon can be seen above the red-tinted horizon, glowing brightly above the observatory. ALMA sits on the Chajnantor Plateau, some 5000 meters above sea level. At this altitude, crystal-clear views of the cosmos can be seen on an almost nightly basis, as shown by the striking cosmic caterpillar gliding over the top of the ALMA antennas in this image. This bright streak is the Milky Way; the galaxy’s bulge of gas and intricate dust lanes is clearly illuminated against the star-studded night sky, with pink-hued patches marking areas of hot, ionised gas produced by newly formed stars. The brightest part of the Milky Way— the very heart of our galaxy—is situated approximately 25,000 light-years away from Earth.